Famed celebrities, well-known filmmakers, and respected journalists will take the stage during the 76th annual Peabody Awards, which honor the best in storytelling. The NBC Bay Area Investigative Unit joins the likes of Beyoncé, Louis C.K. and Julia Louis-Dreyfus as one of this year’s 30 honorees. The ceremony, which was pre-recorded last month in New York City, honored the Investigative Unit for its ongoing series into the misuse of school officers. 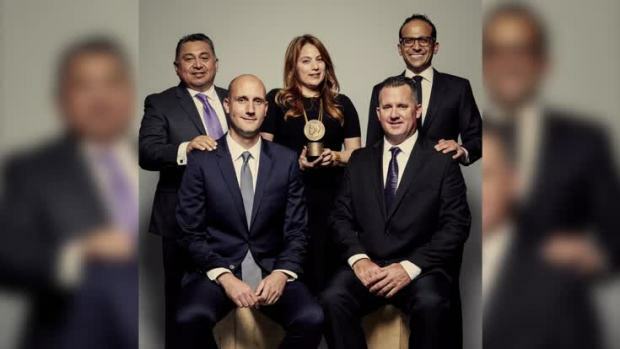 The NBC Bay Area team backstage at the Peabody Awards. The series of reports, "Arrested at School," uncovered a disturbing trend within the education system, captured the attention of top officials at the White House, and spurred security changes across 34 schools in the San Francisco Bay Area that will soon impact roughly 67,000 students. Stephanie Adrouny, Vice President of News for NBC Bay Area, oversaw the series of reports as executive producer. Investigative Reporter Bigad Shaban accepted the award on behalf of the team, which includes producer Michael Bott and photographers Mark Villarreal and Michael Horn. Additional photography was also provided by Jeremy Carroll and Felipe Escamilla. Nelson Hsu and Scott Pham designed online elements for the investigative series, including interactive features that helped make school disipline data easily accessible to online users. Actress Rashida Jones, a previous Peabody Award winner for her work on the NBC sitcom “Parks and Recreation,” hosted the gala that will be broadcast on both PBS and Fusion Friday, June 2 at 9 p.m. PT.